The head of the Iditarod's drug-testing program said Friday that none of the sled dogs in the 2018 race failed their drug tests. Morrie Craig's report to the Iditarod Trail Committee Board of Directors came after a year of controversy for the annual sled dog race, much of it centering on drug testing. Animal-rights groups strengthened their calls for the Iditarod to end. The race organization came under fire from some mushers who said changes were necessary to ensure the race's survival, including restructuring the race's governing board. A consultant also said the Iditarod board would have to make big changes if it wanted to rebuild trust with mushers and sponsors. At the board's daylong meeting Friday, the nine board members spent a majority of their time behind closed doors in executive session. 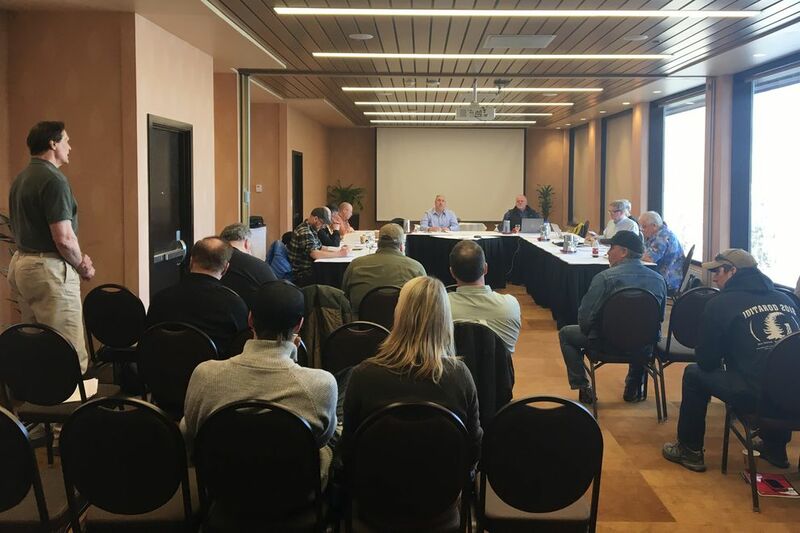 Chas St. George, Iditarod chief operations officer, said they were discussing the board's structure, including controversial conflicts of interest, the role of the musher representative on the board and how board members are selected. St. George said he expected those discussions to continue, with final decisions made by June 30, the first day of sign-ups for the 2019 Iditarod and the end of the fiscal year. "We just got off the trail 23 days ago," he said. During the public portion of the Iditarod board meeting in an Anchorage hotel Friday morning, a small group sat in the audience, including 2018 race champion Joar Leifseth Ulsom, Big Lake musher Rick Casillo and Anchorage musher Scott Janssen, who is also known as the "Mushin' Mortician." Chief Iditarod veterinarian Stuart Nelson brought up the possibility of reducing the maximum number of dogs that mushers can start the race with from 16 to 14. That could lead to fewer dogs left behind at checkpoints during the race, he told the board, therefore reducing the amount of money the Iditarod spends to fly those dogs home. Mushers choose to leave dogs at race checkpoints for a variety of reasons, including injuries, illness or because the dogs can't keep up with the rest of the team. Each year, between 30 and 34 percent of dogs who start the race are dropped along the trail, Nelson said. "It's incredible how consistent the number is," he said. A proposal to reduce the size of the sled-dog teams will go to the race's rules committee for consideration, St. George said. Craig said he did not make changes to the Iditarod's drug-testing program before the 2018 Iditarod. He said urine samples were taken from about 235 sled dogs between the ceremonial start in Anchorage and at the end of the race in Nome. The dogs came from nearly every team, he said. About 60 percent of the urine samples tested positive for trace amounts of substances that the race prohibits, he said. He said that's because the meat the dogs eat is not human-grade. The longtime head of the dog-testing program, Craig found himself at the center of Iditarod controversies last month. Willow musher Wade Marrs, who also serves on the board, accused Craig of attempting to threaten and intimidate him moments before the race began March 4. Craig said he did not intend to threaten Marrs. The board later announced it would "formally reprimand" Craig. Criticism over the race's drug-testing policies and practices began months earlier. Race officials had announced in October that several hours after Dallas Seavey finished the 2017 Iditarod in second place, dogs on his team tested positive for tramadol, a prescription drug the race prohibits. Seavey has repeatedly denied giving the drug to his dogs and said he doesn't know who did. The four-time champion skipped the 2018 Iditarod in protest of race officials' handling of the matter. The Iditarod board's next public meeting is scheduled for May 18.